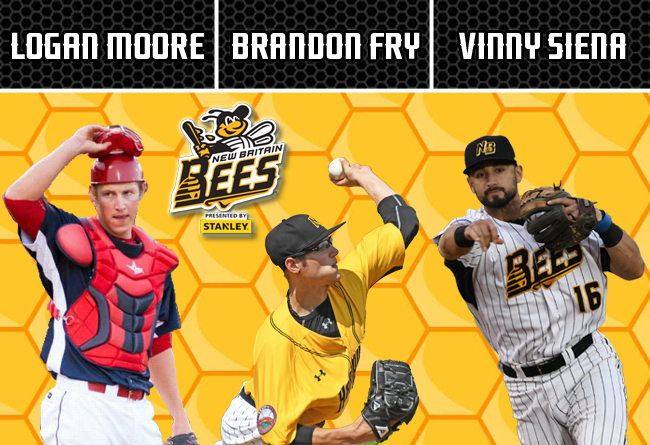 (New Britain, Conn., Feb. 19, 2019) – The New Britain Bees today announced the signings of catcher Logan Moore, pitcher Brandon Fry, and infielder Vinny Siena. Logan Moore heads to New Britain for his first season in the Atlantic League and ninth of professional baseball. The backstop appeared in 75 games with Triple-A Lehigh Valley (Phillies) of the International League in 2018. The 28-year-old was originally drafted by the Philadelphia Phillies in the ninth round of the 2011 MLB amateur draft. He spent his entire professional career with Philadelphia, reaching at high at the Triple-A level from 2015-18. In 542 career minor league games, Moore owns a .219 batting average with 27 home runs, 177 RBI, and 152 runs scored, while holding a .990 fielding percentage at catcher and throwing out 36% of potential base stealers. Brandon Fry returns to New Britain for his seventh season of professional baseball and fourth in the Atlantic League. Last year, the lefthander only appeared in five games with the Bees due to injury. His last full campaign came in 2017 in the Hardware City, when he appeared in 67 games and posted a 4.31 ERA and 53 strikeouts over the course of 64.2 innings pitched. The 25-year-old was originally drafted by the San Diego Padres in the 18th round of the 2013 amateur draft and made his professional with Single-A Eugene of the Northwest League the same year. He spent three seasons in the Padres organization before heading over to New Britain to make his Atlantic League debut during the 2016 campaign. In 165 career minor league outings, Brandon owns a 4.73 ERA and 168 strikeouts in 206.1 innings pitched. Vinny Siena returns to the Bees for his second season in the Atlantic League and fifth of professional baseball. Last year, the CT-native appeared in 73 games with New Britain, posting a .207 batting average with 15 extra-base hits, 26 RBI, and 24 runs scored. The 25-year-old was drafted by the Mets in the 14th round of the 2015 MLB amateur draft out of the University of Connecticut. He spent three years in the New York Mets farm system. In 325 career minor league games, Siena owns a .237 batting average with 65 extra-base hits, 96 RBI, and 153 runs scored.